Ok, you can't leave a blog to die with the last post being a dead cat post. So here is a new one. I recently made a baby quilt. I have made quilts before. I have made baby quilts before too. So I almost, almost know what I am doing...kinda. Soo much easier than figuring it out myself. Instant download and I am on my way. 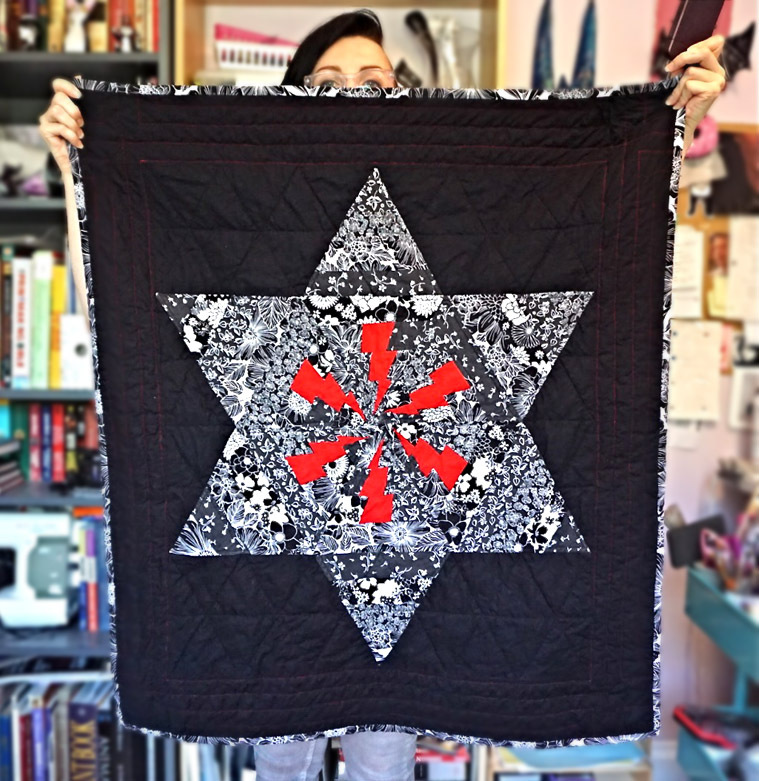 Please buy it if you decide to make a quilt like this. Be cool. 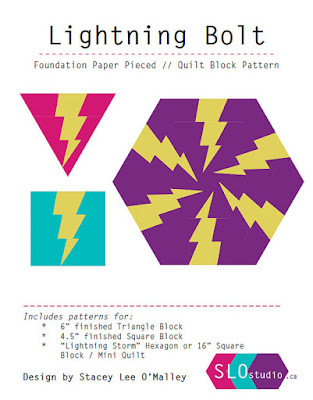 I decided to only do one big lightning bolt block, then add some kinda modified triangles without the lightning bolt around it. 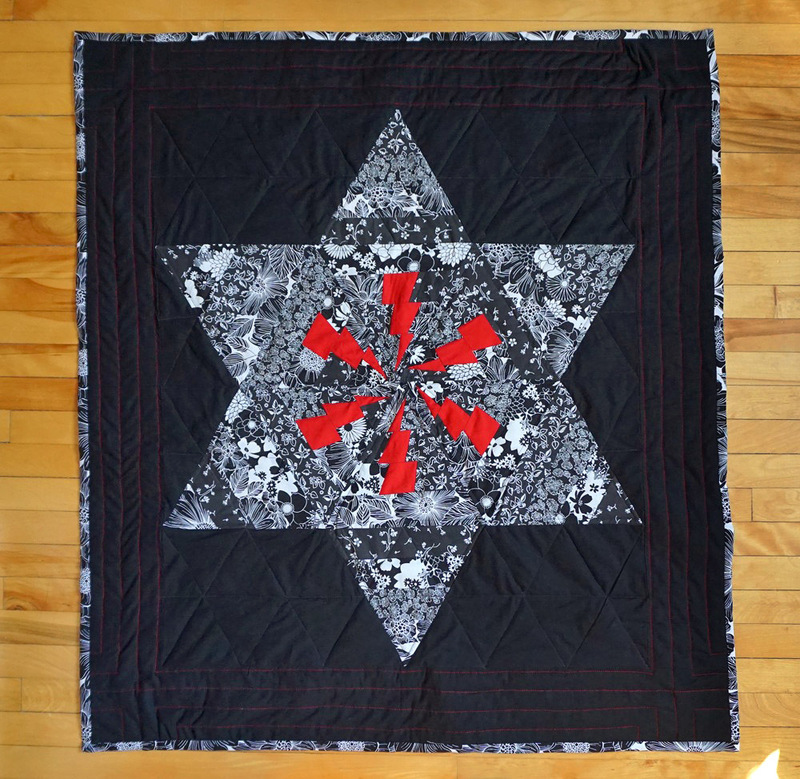 The rest is just solid black quilting cotton pieces. It was pretty easy, the only thing that was challenging was keeping the patchwork patterns from touching each other. I had originally thought I would add more red to other parts of the quilt, but I liked just the pop of colour in the centre. I can never stray too far from my black and white lifestyle! I ended up just using a black and white fabric for the binding. Its backed in a pretty bad-arse (for a baby) flannelette with drum kits and skulls and stuff. I know from experience that having a back that has a busy pattern can hide a LOT of flaws and generally make your life a billion times easier and better. I just bought all these fabrics at my local Fabricland. 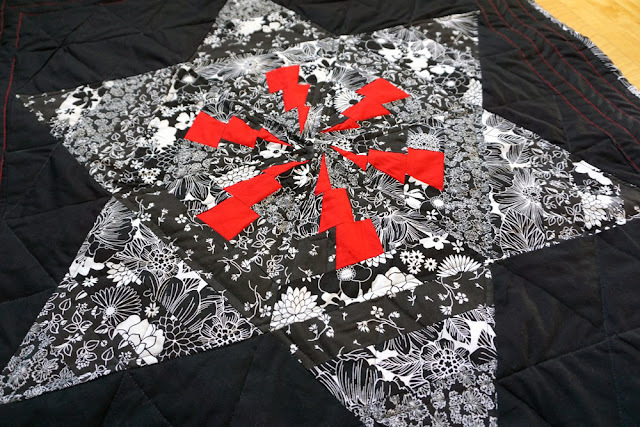 I did some quilting with red thread around the outside. I had intended to do a bolder, fatter red, but didn't have a needle to fit it for my sewing machine. Oh well. Oh and here is a pic for scale. See, its baby size. I think this is after washing it, which I always do to make it all rumpled up and vintage-y looking. I also took pics of it in case it got lost in the mail, which I had nightmares about. 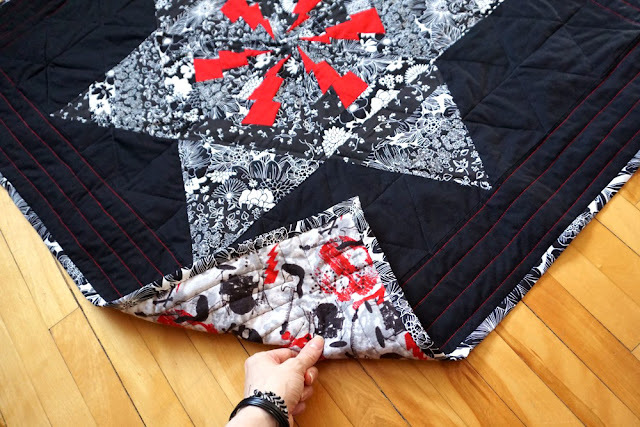 The only major fail I had with this quilt is using Warm and Natural quilt batting, which is nice and all but fibres from it started coming through the quilt top. Its called "bearding" and you can't really fix it unless you take the quilt apart. I usually avoid this problem on my toys and dolls by adding a layer of thin interfacing on the back of the fabric. Fixes it perfectly, but I didn't think of it. UGH. So yay a non-cutesy little wild-child baby quilt. My best friend moved from the big city to a farm in Northern Ontario! 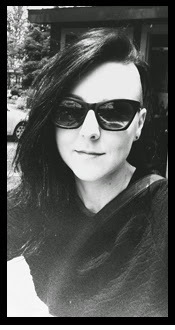 Her blog follows along as she dives in and figures it all out. (Unless otherwise stated) all images, artwork & content are copyright © Tara Fortin/blacklilypie.